The name Zanni is roughly equivalent to the English term "Joe Schmoe" a real nobody! 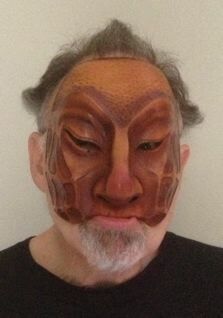 Some of the Zannis shown are taken from traditional Commedia Characters, others invented by Newman or borrowed from contemporary maskers ( The character Stupino created by Gina Bastone). Colombina was not traditionally a masked character; Newman has created a Colombina mask for a German Commedia Troupe.